Let me wish you a very very Happy and Prosperous New Year. Now guess what the amazing fact about this year is? Let's celebrate the start in a great way by resolving to be better and more responsible owners for our pets. Take time this first week of the year to ring in the Year 2011 with some new and precious habits that can benefit you and your pets. 1) Let's stop misusing check chains. 3) Let's make it a habit to talk to our dogs and cats and birds and any other pets every day at least once. 5) Let's Update our owner information! I wish you all the millions of reasons to be happy in the New Year. When you're lonely, I pray my Lord for one more pet for you. When the world seems empty, I wish you can hug your dog tight and you will get EVERYTHING back! Have a Happy New Year and a marvelous time ahead! About German Shepherd Dog reveals an opportunity for all German Shepherd Dog Non-Profit Organizations and Clubs to have a FREE listing of their organizations. About German Shepherd Dog team aims at eventually enlist all the Non-Profit organizations and clubs related to the German Shepherd Dog breed in the website. All they need to know are the perfect address contact details and name of the concerned persons related to a specific club or org. They expect the clubs and the organizations to provide the About German Shepherd Dog team to provide all necessary information in regard to any alteration in their concerned person and/or contact details. Good News German Shepherd Dog Lovers! Good news is that the breed standard for German Shepherd Dog breed has been amended in terms of their coat types. Yes, GSD owners who are enthisiasts of the long coat variety of German Shepherds will be happy now to learn that the Fédération Cynologique Internationale (FCI) has approved adopting the long coat type as a distinctictive breed variety with effect from January 1, 2011. 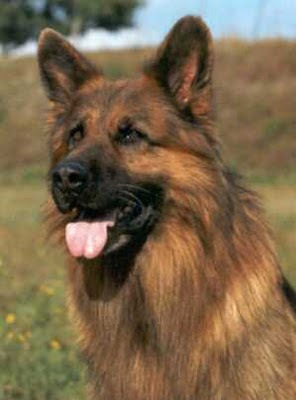 In the resolution of 2008 -2009 Federal Assembly, the SV had filed a motion with the FCI for adopting the coat type “Long Straight Topcoat with Undercoat” as a distinctive variety in the GSD breed. I feel really glad to inform you that the Fédération Cynologique Internationale (FCI) has approved the motion filed by the SV with effect from January 1, 2011. 2) To participate in the breed specialty shows across the globe. 3) To get entitled in the breeding program officially, subject to certain principles to be maintained. Check out in details information on the approval of “Long Straight Topcoat with Undercoat” hair type by FCI. Click on GSD breed Standard Amendement. As usual the German Shepherd Dog Club of West Germany (e.i. SV) had just sponsored the world's largest German Shepherd conformation specialty show this year... 2010! It was a real blast like every year. This year (2010) the German Seiger Show or The World Seiger Show was held in Nürnberg (Easy Credit Stadion) between September 3rd to September 5th, 2010 and there were around 1500 German Shepherds and an incredible number of 30,000 spectators bustled up the show arena. In 2009 is also a remarkable year! In the year 2009 at Ulm, Germany the Sieger Show had been held for the first time. Are you looking for the show results? Check out the detailed show results for German seiger show 2010 and results for German seiger show 2009. Don't miss out checking the entire report for the world seiger 2010. You can find Links to Other Titles too! You can also find the detailed results of GSD breed at Cruft Show this year at Cruft show 2010 or here. Congratulations to all the winners at world seiger 2010! Howdy friends! I have not posted anything for long - I admit. Well, let me tell you that I have a good news for all German Shepherd Dog lovers. I am honored that my blog "German Shepherd Dog Information" has been highly acclaimed and I have got waves of praises from you guys. I have received emails from many of you, and many of you have sent me multiple emails praising me for my highly researched work that I have done with this blog. This motivated me in purchasing my own domain name and hiring a host. Friends I have created my own website About German Shepherd Dog. The design of this website has been done by my friend's web solution firm - "Aribiss". Since the website is a dynamic website and involves tremendous volume of coding, it is taking him a little time to complete. Although it is apparently completed, still there are certain designing issues which requires to be done. The work is in process. About the official website of "About German Shepherd Dog"
About German Shepherd Dog is an online portal dedicated to German Shepherd lovers across the globe. I have been constantly working on this website and aiming to make it the largest online resource for information on German Shepherd Dog breed. I am sure I can do it... your encouragements and fountains of praises have always been the most effective catalyst for me. Please email me or post your comments and give me your feedback about the newly launched website, especially dedicated to you and your dream breed. I know you will find a few programmatic errors in this website. Everything will be fixed eventually. Note: All owners of the above mentioned dogs are requested to provide us with the pictures of their dogs qualified in DFS Cruft, 2010. we will be happy to incorporate the pictures with their show results. Many many congratulations to all owners and dogs above qualified in the ring of DFS Cruft 2010. If you are a lover of German Shepherd Dog breed, chances are that you have always liked to meet new German Shepherd owners and mingle with new dogs. By doing so, I am sure that you have, at least once in your life time, met shepherds with strange behavior. Overly aggressive German Shepherd Dogs are menace to not only the owners but also the other animals and friends of their owners they meet. The fact is it’s due to the lack of knowledge of the owners that many shepherds become aggressive. Well, aggression is a genetic trait that stimulates the protective drive of the breed. Over aggression in German Shepherd Dogs is a psychological imbalance and a serious fault in the breed, being a deviation from the standard of GSD behavior. Now this topic is all about tips and tricks to handle an overly aggressive German Shepherd Dog. The piece includes some points that may help you make your German Shepherd Dog learn good habits. The process of teaching should start at the very young age, but since most dogs start displaying aggressive behavior in the later age you need to be well equipped with the technical know-how of teaching good things that can be applied at any point of time in his/ her life. Remember German Shepherd Dog is a very intelligent breed and has the tendency to please their master. This is a very important thing to understand. Make your dog please you and show that you are pleased when he shows desirable behavior. Most GSD owners, I have come across, cannot understand how to get their overly aggressive shepherds to learn good habits. Dogs are not humans and understand things in a very different ways. So often, when an untrained trainer is training your German Shepherd Dog he is actually contributing to the behavioral problem, thereby making them worse! My first tip to solving this problem is to find the right trainer, who knows how to communicate with and train a German Shepherd Dog with all full proved techniques. Here are four German Shepherd Dog training tips to give a try before making the decision to have them put down. 1. Most important problem area: Unscientific breeding is the most important problem area that needs to be spared a serious thought over. Overly aggressive German Shepherd Dog all through his life shows warning signs that it is not like the other friendly canine companions. Choosing the right German Shepherd Dog breeder is very important. Both the fear based aggression and dominant aggression are due to poor breeding, while territorial aggression and predatorial aggression in German Shepherds are normal and desirable to a certain degree. 2. Training sessions: To start off with you need to boost up the confidence and make your dog feel the sense of security while setting the training session. Overly aggressive German Shepherd Dogs usually have some kind of fear psychologically week with low degree of hardness trait in their character. With lack of confidence and psychological resiliency to unpleasant and strange situations you cannot solve such behavioral problems. I would suggest you to create a perfect environment around the training zone. You can invite a few friends of yours whom your dog knows well. With the gradual passage of time you can invite a stranger along with your friends and go on for stroll in the park with them and your dog. Gradually increase the number of friends and stranger. This is a very important socialization technique and should be a slow process. By making slightest haste in this you may unknowingly contribute to your shepherd’s behavioral problem instead of solving it. This will pull down his stress level and make him feel comfortable. 3. Mingling with other dogs: Most aggressive dogs cannot tolerate other animals within their vicinity, which makes them show aggressive behavior towards them. This problem in the German Shepherd Dog personality can be solved, though not a very easy task. Mingling session has to be at as soon as possible. Keep your dog on the leash in a region having a few other more confident and calm dogs. Hold the leash tight and as soon as he shows signs of aggression, just give him a jolt with a sharp “NO”. Repeat it whenever he shows signs of anger. Keep a constant eye on him and you can predict how he will be behaving on a specific situation a few seconds prior to he actually shows the aggression signs. As soon as you can predict his behavior, give him a jolt with a sharp “NO”. It will take a lot of time to socialize your German Shepherd Dog with other dogs. You need to be patient and consistent and handle him correctly. 4. Keep your dog away from other aggressive adult dogs: Remember dogs are pack animals and they live a pack life. Their specific behaviors are usually the resultant products of staying together within the pack, which is very natural. If they do not consider their owner as the pack leader they will take it upon themselves to become the leader of the pack which tourn out to be quite detrimental. If you have a new addition to your kennel, keep the new dog or puppy away from the other aggressive members of your kennel. Studies have shown that dogs and puppies that are in contact with the other aggressive mates usually become aggressive as times pass by. Get the new dog surround with cool tempered, confident, well mannered, playful dogs with positive behavioral traits. To conclude with I would like to say that your aggression towards the dog will never solve the problem of aggression your dogs. So don’t lose your cool on your dogs. You have to be patient and tactical enough to handle a overly aggressive German Shepherd Dog. A German Shepherd Dog who have been battered can turn out to be overly aggressive at to humans. Here's how to help battered German Shepherd Dogs regain confidence. Looking for more German Shepherd Dog information?